3D printers take data from a computer generated model and translate that into a real, solid form. The two most popular methods are FDM and SLA. Fused Deposition Modelling (FDM) is a process where small amounts of plastic are heated and fused together layer by layer to create a three-dimensional structure. Steriolithography (SLA) works by using a laser to solidify a photopolymer (light reactive plastic) resin. The UV light is projected onto a point in the resin, causing it to become solid one layer at a time. It is already making an enormous impact in prototype development by giving the designer the ability to go from an idea to a physical object within hours. In contrast, creating prototypes using conventional methods can take weeks and is often costly. This all adds up to a faster turnaround on projects, months shaved off the design cycle and a whole lot of money saved in the process. The potential applications for 3D printing cross a huge range of business sectors from interior set modelling, architectural design and dentistry to rapid product prototyping and scientific and structural research. 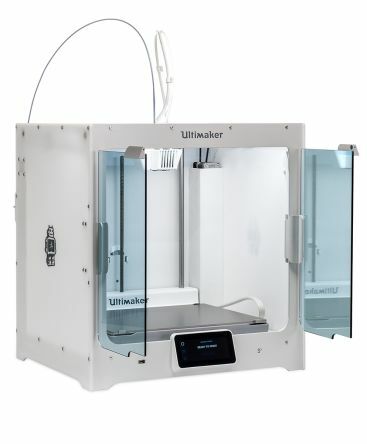 The Ultimaker S5 is a 3D printer that combines the easy to use features of previous Ultimaker models with a large build volume and the ability to print industrial grade parts. This printer has been designed with professional requirements in mind and is being actively used and endorsed by businesses such as Volkswagon, who have achieved great cost savings and reduced downtime in their manufacturing facilities by using Ultimaker printers. The Ultimaker S5 provides a complete professional 3D Printing solution. The RS Pro iTX PC 3D Printer is a combination tool that’s been designed with ease of use and easy upgrade path in mind. With quick-change components like the VariBLOCK head unit, PCB’s and the filament extruder, and the fact that it is open source means it can be modified by anyone with the necessary skills. A key feature is the built-in PC, which is based around an ASROCK Mini ITX, sporting an AMD FT3 Kabini A4 quad-core processor and an AMD Radeon 4K graphics card, Ethernet access, sound card, 8GB Ram and a 500GB SATA disc-drive. This built-in PC, which is running Windows 10 Home, allows your do add whatever peripherals you want, such as a monitor, keyboard and mouse, networking etc. for dealing with your 3D CAD designs at the coal face. Plus, you can upgrade the PC if you need to!